I never planned to start truffle hunting, it was the by-product of wanting a truffle orchard. I never planned to have a Lagotto, there just happened to be a puppy available when a friend told me about them. However, these happy coincidences have without doubt had a profound effect on my life. Mufti, my Lagotto, is the best partner for truffle hunting that anyone could ever wish for. I use the word partner advisedly because once we are in ‘working’ mode, there is a constant stream of information passing between us. We work in silence, yet our signing vocabulary is extensive. 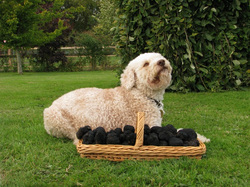 Most dogs can find truffles, truffles are really quite pongy. It’s what happens next that is the most important. I don’t want dogs to eat truffles, I don’t want dogs to slobber on truffles, I don’t want dogs to grate truffles as they dig recklessly through the soil. My dogs must find truffles and wait for me to arrive. This was initially dictated because of my illness but goodness me, a well mannered truffle hound is a pure pleasure to own. I did not realise it at the time, but these standards are the envy of everyone else with hooligan hounds! Mufti and I work together. I ask her for information and she relays it to me to the best of her ability. She includes everything that has the truffle scent. She tells me the whereabouts of truffles. She identifies rotten truffles. She identifies an area where truffles have recently grown, a valuable factor for landowners. Each piece of information has it’s own separate indication style. It has taken six years of listening to work out what she is saying. She actually is trying to tell me about a fourth statement but as yet I cannot understand it. Scent work is very demanding for dogs. They put in huge amounts of energy, but as if by way of compensation, they also find it very rewarding. Mufti can work for a whole day. She gives every ounce of her heart in such a generous way I am always amazed at her. Even if I put her on ‘playtime’ for a rest she automatically goes back into ‘working’ mode as soon as she picks up the truffle scent. She is truffle happiness on four paws.